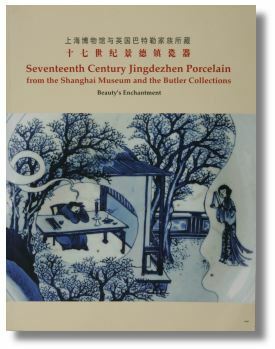 Beauty’s Enchantment, Seventeenth-century Jingdezhen Porcelain from the Shanghai Museum and the Butler Collection, by Sir Michael Butler and Prof. Wang Qingzheng. This book is a catalog from a joint exhibition between the Shanghai Museum and the Butler Collection, covering the period from 1621 to the Mid Kangxi period. The section introductions and captions take their basis in the historical events of the time and explains how this is reflected in the porcelain pieces discussed. The text as well as the illustrations are first class. If you look for one book only covering the Ming-Qing Transitional period, this volume would be my personal choice. It’s really outstanding. Another highly appreciated feature is that whenever possible, the bases and any present marks are illustrated in full color. All entries in the catalog are also individually signed by the authors. If you can find a hardbound version it would definitely be worth it. My copy is paperback but given a choice, the quality of the content definitely motivates a better binding. The book is written by several authors, but flows seamlessly through what is commonly referred to as the Transitional Period. It is rich with helpful insights into production techniques, political history and attribution tips without laboring over each point. Donâ€™t just buy it for the nice picture, READ IT! It will be time well spent. I was astonished to see the collection of Sir Michael Butler. This is really a good reference book for serious porcelain collectors !!! One of the best collections of high-end Shunzhi porcelain I’ve come across and excellent value for money as well.